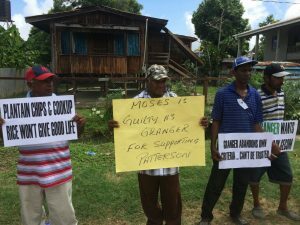 “Patterson as Gecom chairman cannot deliver!”. “Granger/ Moses can’t be trusted!”. “Granger wants to hijack Gecom!”. These are just some of the slogans while over 200 People’s Progressive Party Civic (PPP) supporters uplifted placards and took to the streets earlier Thursday as Guyana’s Prime Minister Moses Nagamootoo made his way to deliver the feature address at the Corentyne Comprehensive Secondary School’s graduation ceremony. The protesters, as the Prime Minister and his delegation made their way into the school at Port Mourant, chanted “Nagamootoo sell out the people”. Nagamootoo is a former long-standing PPP member alongside now late co-founders Cheddi and Janet Jagan. 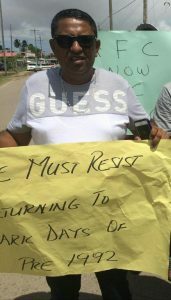 Organizer of the peaceful protest, PPP Regional Head Zamal Hussein relayed that the protest is the first of many opposing President David Granger’s unilateral appointment of the Guyana Elections Commission (GECOM) chairman, Retired Justice James Patterson. Hussein told Demerara Waves Online that government should rescind the decision made noting that the PM colluded with A Partnership for National Unity (APNU) to appoint an “unfit” chairman to lead the elections commission. “This is the just the starting here because we are concerned about the appointment of Patterson as the Gecom chairman and we are asking the President to rethink his decision”. According to the party head, the Prime Minister should ‘speak out’ against the decision because it can severely affect the outcome of the next general elections. “This is a recipe for high class rigging and we need to speak out against this. Of all the people that were submitted by the Opposition Leader, why did he choose an 84-year-old man to run GECOM”. Government has already retorted that Retired Major General, Norman Mc Lean- one of Opposition Leader, Bharrat Jagdeo’s 18 nominees who were rejected- is also in his 80s. Hussein stressed that they will continue to protest the officials of the Government when they visit Region Six (East Berbice- Corentyne) until government reconsiders its decision. 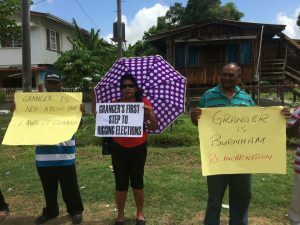 Meanwhile, protesters present told Demerara Waves Online News that the President sought to hijack the elections commission by unilaterally appointing an elderly man as the head. One protester, Vigily Motie, emphasised that the President chose the darkest night- Diwali- to announce his decision, deemed a cowardly move. “He wait till the darkest night. Diwali night to say he appoint an old man to run Gecom. A proper list was submitted by Jagdeo (President) Granger did not chose someone from the list”. Another protester, 81-year-old Barosah Singh mocked the President’s appointment and jokingly opined that since his age is suitable, he can apply for a position in Government. “Me is a ah old man and is people like me dem putting fah run ministry and suh. Is best me go and apply fah one wuk deh since dem want old man wah near dead fah run GECOM”. President David Granger has maintained that his appointment of Retired Justice James Patterson as Chairman of the country’s elections management authority is in keeping with his perception of “fit and proper”. The PPP has since asked the High Court to quash Patterson’s appointment on several grounds including perceived political bias.